Takeaway: Employee burnout can contribute to fatal accidents. Certain strategies, like ensuring that employees understand the purpose of the work they're doing, can help you mitigate this risk. The story is familiar. An inexperienced crew, a foreman under pressure to finish the job on time, safety procedures ignored in favor of expedience – each an ingredient in a recipe for disaster. According to the United States Department of Labor, 937 worker deaths occurred in privately run construction companies in 2015 alone. The leading causes of these deaths were falls, followed by struck by an object, electrocution, and caught-in/between. Those numbers categorize events leading to deaths but don’t explore the underlying cause of the fatalities. 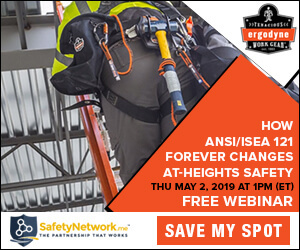 For instance, why would a foreman, well versed in the necessity of providing anchorage for workers’ safety belts, fail to ensure the proper use of fall protection equipment? While cutting corners to save time is a cause of accidents in these industries, it’s just one piece of the puzzle when addressing fatalities caused by human error. Stress and burnout may be hidden factors in accidents because they erode resilience and disrupt engagement. According to a study conducted by the Institute of Naval Medicine, individuals who are stressed are more likely to have an accident in the workplace because of a propensity for cognitive failures. These cognitive failures show up as forgetfulness, distractibility, and false triggering (interrupted cognitive and motor functioning). Of course, a certain amount of stress is an unavoidable byproduct of any high-pressure job but stress that overwhelms the worker to the point of exhaustion and de-motivation is to be regarded as a serious safety hazard. This particular kind of stress leads to burnout, which not only has an impact on the individual employee, but can also poison the work environment, further corroding morale and engagement (learn about The Importance of Employee Engagement and Its Impact on Your Bottom Line). According to the American Institute for Stress, job stress costs the United States economy approximately $300 billion in sick time, long-term disability, and excessive job turnover. This estimate doesn’t include the $450 billion to $550 billion that Gallup says disengaged workers cost the United States annually. Additionally, in 2013, UNC’s Keenan-Flagler School of Business noted that organizations with higher engagement and well-being had on average 48% fewer safety incidents. According to the psychologist Christina Maslach, burnout is a syndrome with emotional exhaustion, depersonalization, and reduced personal accomplishment as its core features. In order to understand burnout, consider the metaphor of a house on fire with you in it. You’re in your kitchen and the stove suddenly goes up in flames. As you try to put the fire out, you notice that it’s spreading to the dining room curtains. When you run to the dining room with a fire extinguisher, you notice the flames making their way up the stairs. This is when you grab the dog and run outside to a safe spot in the yard. You’re no longer trying to save the house. Your main goal – your only goal – is to survive. Work-related stress feels like this. It overwhelms our capabilities and resources. If it is left unaddressed, accidents are likely. Is Your Workforce at Risk? When workers feel like they lack control over their work environment, believe they are being insufficiently rewarded, don't have access to a supportive community, sense that there is an absence of fairness, and are carrying a work overload, the risk for employee burnout is high. In both the construction and energy industries, where transient workers who’ve left their home states or countries to find work are employed, isolation from families sets these workers up for greater risk of burnout. Consider also the after-work activities and living conditions of this transient labor force. Heavy alcohol consumption or drug abuse coupled with a dank living space at the end of the shift underscores both their isolation and sense of unfairness. These factors also contribute to impaired cognition (to learn more about your duties to these employees, see Transient Workers vs Temporary Workers: Know Your Training Obligations). Finally, the constant struggle to maintain safety practices while meeting “get it done yesterday” deadlines will certainly increase the risk of burnout in both labor and management. Labor and site management typically experience inclement weather or accelerated deadlines most acutely at the raw, physical level. Showing up to the site to acknowledge their efforts when the air is thick with frustration can turn around the perception that leadership is out of touch. If your transient workforce includes non-English speakers, it’s essential they receive the same messaging and directions English speakers receive. You shouldn’t rely on the person who has the best bilingual skills on site. Their skills might not be sufficient to understand and translate the technical knowledge necessary to maintain safety management. Moreover, when non-English speakers feel marginalized and left out of the loop, they’re more likely to disengage (for more advice, consult these 5 Steps to Creating a Culturally and Linguistically Diverse Workplace). If a primary cause of burnout is feeling a lack of control in how the work is done, shift that front-line experience by tapping labor’s on-the-job expertise. When labor senses that you trust and listen to their input, they will take greater ownership over the project and be less likely to fall prey to burnout. This strategy is a call for smarter communication to the entire crew, not just the executive leadership. Telling them that “the deadline has been moved up because the community is relying on us for their electricity” is a more engaging message than “get it done sooner because I told you to.” When your workforce believes that their work serves a purpose other than making your board happy, they will make the extra effort and feel valuable doing it. A Canadian study revealed that 33% of trades helpers and laborers reported poor mental health. Self-medicating in the form of prescription and illicit drugs to quiet traumatic stress symptoms is a common response to mental stress. It’s also important to note that construction workers’ illicit drug use was reportedly double that of other laboring professions. While instituting random drug testing would certainly cut down the risk of accidents, providing alternative resources such as employee assistance programs would mitigate rising absenteeism and disability leave. One of the main features of burnout is depersonalization, which is experienced as a detachment of the self and may be accompanied by emotional numbing. Therefore, those who suffer from burnout don’t necessarily grasp what’s happening to them. Or, if they experience heightened agitation, they may notice feeling frustrated and short tempered but they’re likely to think it’s everyone else’s problem rather than their own. Creating awareness campaigns and training initiatives to recognize symptoms of burnout and the heightened risks caused by distractibility and disrupted cognition may save these industries from excessive injury and wrongful death claims down the road. Charlotte DiBartolomeo, M.A.C.T. is CEO and founder of Red Kite Project, a resilience-building firm training and consulting within high-pressure industries to mitigate the impact of burnout. DiBartolomeo is also a faculty member at Drexel University, where she developed and teaches Trauma Informed Care in the Department of Behavioral Health Counseling.